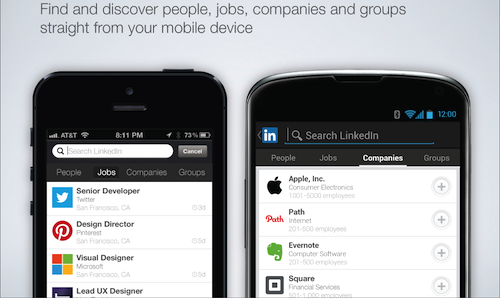 LinkedIn today announced it has updated its mobile app for Android and iOS with expanded search functionality. You can download the new apps now directly from Google Play and Apple’s App Store. In addition to being able to search for people, LinkedIn says its mobile app for the two platforms now lets you find jobs, companies, and groups via the magnifying glass icon at the top of the navigation screen. Putting that in numbers, the company says you can now discover more than 225 million professionals, 3 million company pages, 2 million groups, and thousands of job opportunities while on the go. Get up-to-the-minute professional intel: Use the feed to stay on top of industry news, access advice from the top minds in business, check out who has joined a new company or received a promotion, and share your own expertise. Save time by customizing your app navigation: Take a moment to personalize your shortcuts from the navigation menu to ensure your favorite features are easily accessible, such as Companies and Connections, but also News, Groups, Jobs, People You May Know, Who’s Viewed Your Profile, and Your Recent Activity. Yet a closer look at the changelogs for both Android and iOS shows that the only real addition here is the new search, which the company has also made faster than before. We’ll keep you posted when LinkedIn adds more.